In feng shui, using carved quartz to activate love energies can be a powerful tool in the quest to find romance or solidify the one you already have. The beautiful quartz crystals are not only pleasing to the eyes, they also carry positive chi and can activate a feng shui love sector. There are many different types of quartz crystals. Some quartz is formed naturally from years of pressure and heat by natural forces. Other types are manmade. For feng shui purposes, the best type of quartz are the ones that are made naturally. These quartz types are very good for healing sensitive chakra areas and activating specific spaces of the bagua. Quartz and crystals have been used for centuries to clear out negative energy and promote healthy, balanced energy. In feng shui a love carved quartz can be a powerful force in attracting and keeping the love you want. When it comes to love, the best quartz color to pick is pink, or rose quartz, since the color symbolizes the energy of love, unity, and happiness that comes from being in a balanced partnership. Likewise, rose quartz is a well-known crystal used in energy healing to attract love. Several different methods are used to cleanse quartz crystals. This will get rid of any energy collected from where it has been before you obtained it. You can also program the crystal for a specific intention if you wish. When it comes to placement of the feng shui love carved quartz, grab a compass and locate the southwest corner of your home since this sector is associated with love and relationships. This area is the ideal spot for a rose quartz crystal. If you are having trouble locating this direction, simply hold a compass in the middle of the room to allow the compass to guide you. Quartz can be placed in other areas of the home, like a home office, a study area or even in the center of a living room, but rose quartz is better off being placed in a bedroom. You can place it in the southwest corner of your bedroom or on a bedside table for optimum benefit. Having a pair of carved rose quartz hearts or other love symbols will create even more love energy in your bedroom. Rose quartz carved into shapes, particularly hearts, are very common since the energetic association between rose quartz and love is so strong. Likewise, rose quartz is plentiful and therefore affordable. If you can't find carved rose quartz, then you can use any rough or tumbled rose quartz in its place. A rose quartz palm stone costs around $11 and it's small enough to hold in the palm of your hand. 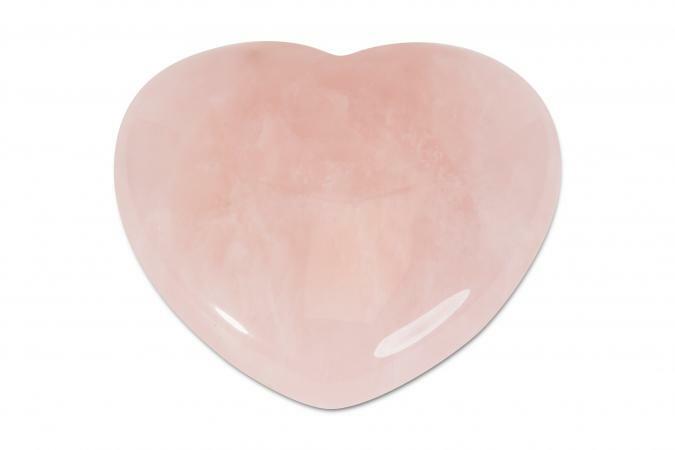 For about $10, you can order this lovely rose quartz heart online. Your local metaphysical and/or crystal shop is also likely to carry rose quartz carved into heart shapes. Purchasing a feng shui carved rose quartz makes good sense for a feng shui home design addition. This is true whether you are already paired with a partner or still searching for love. Not only are these crystals said to help in love, but they also are so charming in appearance, that they'll be a lovely accent in your room.